Equality of opportunity is a core American value. Young people in this country—regardless of wealth, home language, zip code, gender, sexual orientation, race or disability—deserve the chance to learn and achieve. Education must provide a path to the middle class for everyone who strives to get there. Our national identity—and our economic strength— depend on it. Education cannot fix every challenge in a child’s life—but education has always served as the engine of opportunity in this country. America values being a land of opportunity. But economic mobility is actually greater in numerous other countries. Our international competitors are improving faster than we are, and many are having significantly greater success in closing achievement gaps, which in the U.S. remain stubbornly wide. While we’re making progress, only 24 percent of high-poverty 4th-graders in the U.S. scored proficient or above in math on the most recent National Assessment of Educational Progress, compared to 59 percent of other students in this country. In some grades, white students outperformed their black and Hispanic peers by as much as 26 points. Our country’s persistent achievement gaps reflect equally significant opportunity gaps. Low-income and minority students are suspended and expelled and drop out at higher rates than others, and are less likely to have access to strong teachers and to a challenging curriculum. For example, a recent study of the computer science Advanced Placement test found that in 11 states, no African-American students took the exam; in eight states, no Hispanic students did. Minority students also experience inequitable disciplinary practices, including disproportionate rates of suspension and expulsion. While one might expect schools in low-income communities to receive extra resources, the reverse is often true; a U.S. Department of Education study found that 45 percent of high-poverty schools received state and local funds below what was typical for other schools in their district. These inequities have a real and measurable impact on our country’s economic vitality. Minority students and students from low-income families attend and complete college at far lower rates than other students. A growing number of voices—including the Equity and Excellence Commission—have called upon leaders at all levels of government to redouble efforts to close opportunity and achievement gaps and to ensure all students have access to a high-quality education. The goal is to support states and districts in identifying and closing educational opportunity and achievement gaps and ensuring that all students—particularly those with the highest needs—graduate from high school college- and career-ready. Grantees would enhance their data systems to place a sharp focus on the districts, schools, and student groups with the greatest disparities in opportunity and performance, while also being able to identify the most effective interventions. They would develop thoughtful, comprehensive strategies for addressing these gaps, and use the data to continuously evaluate progress. Grantees would invest in strong teaching and school leadership, using funds to develop, attract, and retain more effective teachers and leaders in high-need schools, through strategies such as individualized professional learning and career ladder opportunities. States would collect data on school-level expenditures, make that data transparent and easily accessible, and use it to improve the effectiveness of resources and support continuous program improvement. Participating districts would be required to ensure that their state and local funds are distributed fairly by implementing a more meaningful comparability standard based on this school-level expenditure data. RTT-Opportunity funds also would be used, for example, to provide rigorous coursework; improve school climate and safety; strengthen students’ non-cognitive skills; develop and implement fair and appropriate school discipline policies; expand learning time, provide mental, physical, and social emotional supports; expand college and career counseling; and identify and carry out strategies that help break up and mitigate the effects of concentrated poverty. The program also will help states and districts to improve the use and effectiveness of resources from other federal programs. 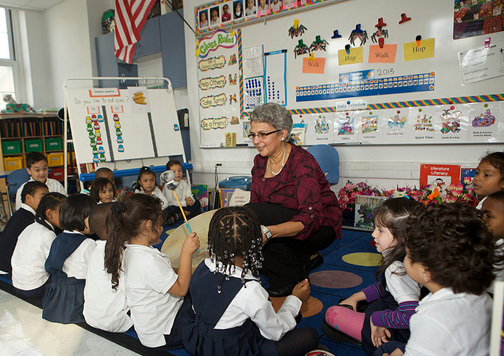 The strategies supported by this fund will complement other crucial efforts to combat the effects of poverty and disadvantage, including the Preschool for All effort; improving support for teachers and school leaders; helping schools to improve safety; increasing college affordability and success, and other efforts to increase equity of opportunity.